Breed Group: Toy Weight: 6-8kgs Height: 30-32 cms Color(s): brindle, solid white, red, or fawn, or any of these on a white background Coat: The coat of the Bulldog is close, straight, short, glossy, and smooth. It is of fine texture and there is no feathering, fringe, or curl. Distinct feature: The Bulldog is moderate in size, heavy, and built low to the ground. They are strong, kind, amiable, and courageous. This breed is not vicious or aggressive and is quite dignified. They possess a passive demeanor and have a quirky sense of humor. Temperament: This breed is loyal, exceedingly affectionate, and deeply devoted to their family. 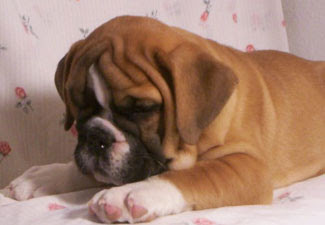 The Bulldog is dependable, gentle, and does well in a home with children. They will get along with other pets they have been raised with but may be rude and try to bully strange dogs. They thrive on human attention and are dependent upon it for their happiness and well-being. The Bulldog has excellent guarding abilities but will only bark when absolutely necessary. This breed is very possessive of food and should never be fed in the presence of children or pets. Activity: The Bulldog must have daily exercise to stay fit. A securely leashed walk will suffice. Large Dog Breed Bull Mastiff .. English Mastiff ..French Mastiff.. Neopolitan Mastiff ..Great Dane.. St.BernardMedium Dog BreedAustralian Sheperd ..Beauceron..Belgium Shepherd.. Boxer..Chow Chow..Dalmatian..Dobermann.. German Shepherd..Golden Retriever..Grey Hound..Irish Setter..Labrador Retriever.. New foundland..Pointer.. Rajyapalam..Rottweiler.. Rough Coolie..Siberian Husky..SMALL DOG BREED Basset Hound..Beagle.. Bichon Fries..Bull Dog – English ..FrenchBull Terrier.. Chihuahua..Cocker Spaniel..Dachshund..Jack RusselTerrier..Lhasa Apso..Maltese.. Miniature Pinscher.. Pekingese..Pit Bullterrier..Pomeranian..Poodle..Pug..Samoyed..Scottish Terrier..Shih-Tzu..Tibetan Spaniel..Yorkshire Terrier.. Basic Obedience and Advance training , first time introduce whistle and Action command in Chennai city with door steps. (DOGS LOVERS, MONEY INVESTMENT WITH LAND OWNER to contact CHENNAI CITY only) Wanted partner To start All kind dogs training center, Academy in International standard. .
follow up my current Resume. EXTRA CURRICULAR—BOXING & ALL KIND OF DOGS HANDLING IN MY DOG TRAINING CENTER. PRESENT EMPLOYMENT--SERVICE IN MY DOG TRAINING CENTER SHEKAS DOGS INTERNATIONAL.CHIEF DOG TRAINER, INSTRUCTOR. KINDLY VISIT MY ATTACH FILE.